County Durham-based Stanley Travel is moving up another gear after acquiring a second vehicle depot, with the help of law firm Ward Hadaway. Asset Alliance Group, a UK provider of commercial vehicle finance solutions and retailers of new and used trucks and trailers, has acquired specialist bus and coach finance intermediary Forest Asset Finance Limited. Essential Fleet Services (EFS) is to exit the passenger services market, through a managed process, and is to focus on its core business activities which centre on the provision of specialist fleet. Scotland’s largest privately-owned public transport operator, McGill’s, has acquired the local bus routes and vehicles of Coatbridge-based, McNairn Coaches (including JJ Travel), for an undisclosed sum. 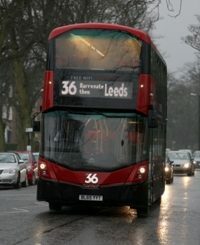 New generation of ‘twin decks’ launched for pioneering route 36 in Yorkshire Transdev in Harrogate has re-launched route 36 between Ripon, Harrogate and Leeds with 14 new 11.5m-long Wrightbus Gemini 3-bodied Volvo B5TLs. CHINA Shanwei in Guangdong Province is gradually introducing 300 BYD (Build Your Dreams) K7 eight-metre electric midibuses. The city administration held a ceremony to celebrate the initiative and welcome the green buses. Arriva Italia has acquired the remaining 51% of Cremona bus operator, KM SpA which has a fleet of 100 buses and employs over 110 employees.